During the prayer each evening of the meeting, Brother Alois gave a meditation. The texts of these meditations are published here. It is a great joy to be together. For the fourth time we are holding a European meeting in Poland—twice in Wroclaw, once in Warsaw, and now Poznan. For the fourth time the young people of Europe are discovering the beautiful hospitality of Polish families. When you arrived, you received the Letter from China. The question that guided me in writing this letter is this: Why should we believe today? What are the reasons that may lead someone to believe in God, in Jesus Christ? Two of my brothers and I made a three-week-long visit to the Christians of China. What struck me in this country was to see a spiritual longing present in so many young people. I met young people who were not believers and who are turning to religion. An elderly woman told us: "After so many years when no expression of faith was possible, now more and more non-Christians are coming to see how we live." A young man explained: "The Chinese soul has always believed in heaven, in a beyond. The past decades have not wiped this out. In recent years material life has fortunately improved, but at the same time many feel a spiritual void and are looking for meaning in life." In the West, thought we have a very different history, do we not find ourselves facing similar issues? Economic progress, and still more the current calling into question of this progress, does not allow us to close our eyes any longer. We cannot avoid asking ourselves: What can give direction to my life? What goal can I choose that is worth the effort? We all feel that there needs to be major changes in our world. The structures of our societies and patterns of thought from the past are proving to be inadequate and insufficient to ensure that persons and peoples can live together in peace. But we also discover that necessary change, particularly an overhaul of the world economic and financial system, is not possible without a change in the human heart. How can we lay the foundations for a fairer system as long as some continue to want to accumulate wealth at the expense of others? We are here together so that each of us can begin or deepen such a change of heart. From what source can we draw to undertake this change of heart? In every human heart there is a longing, a thirst for life in fullness. It is the longing to be loved and to love. Tomorrow morning, in the small groups, you will reflect on this longing common to us all. But at the same time, we all experience that this longing is only rarely satisfied, and never for all time. Far from discouraging us, this can allow us to discover over and over again a personal communion with God. Is not this thirst within us a mark engraved by God in us so that we can turn towards him? And then our heart changes. And not only our heart, but also our way of looking and our behavior. We become more able to discern: without being naïve we become better able to dialogue, to reach out to others, to make our life a pilgrimage of trust. And in this way we will contribute as Christians to help determine the face of the new world that is emerging. A child: Every evening we will mention the names and pray for the peoples who are here. This evening we welcome the young people from Norway, Sweden, Finland, Denmark, Iceland, Portugal, Spain, Italy and Malta. (Brother Alois) For several years now young Polish people in Taizé have been telling me: "Come to Poznań for a European meeting!" We are very glad that today this is possible. For us brothers, love for Poland is part of the legacy that Brother Roger left us. He was so especially attentive to Poland and to Polish youth. We thank our dear friend, Archbishop Gadecki, for inviting us. We thank the ecumenical group of Poznań, representing the Catholic, Orthodox and Protestant Churches, for coming to Taizé to confirm the invitation. We thank the Mayor of Poznań for adding his voice to these warm invitations. Now the Archbishop will speak to us and I will say something at the end of our prayer. Archbishop Stanislaw Gadecki: "We are happy you have come"
With the authorities and inhabitants of the city of Poznań and of our region, with representatives of other Churches and ecclesial communities, I welcome all the young people who have arrived here from the East and West, the North and South of Europe, as well as those who also have come from other continents. We are very happy that you have come and we want to welcome you in the best way possible. We appreciate your presence as a magnificent gift to the diocese, the oldest in Poland, to all the Churches and ecclesial communities present here, to the city of Poznań and the whole of Poland. I warmly welcome Brother Alois and all the brothers of the Taizé Community. I thank them for choosing to hold this stage of the "pilgrimage of trust on earth" in the city of Poznań – "where Poland was born and where the story of its Christian life also began." From here has come Brother Marek, the first Pole who entered the Taizé Community. From here also has come a group of highly committed young people, knowing well the ideals of Taizé. They believe that all young people form one family of God’s children irrespective of differences in language, culture and nationality, as well as of different historical, cultural and religious contexts. Brother Roger, the founder of the ecumenical community of Taizé, saw clearly that for this large family of young people, divisions between Christians are a problem. He was equally convinced that Christians could find the unity so desired by Christ only through an ecumenism nourished by the Word of God, by the celebration of the Eucharist, by prayer and contemplation. Previously – in the liturgy of the early Church – the Bishop called out after the homily: Conversi ad Dominum. After these words the faithful stood and turned towards the East, that is to say towards Christ. Yes, it is only by looking together at Christ that we will find the unity we desire so much. Today, thirty years after the birth of "Solidarity", which marked the beginning of a process to regain freedom in several countries of our continent and to begin a new stage of the unification of Europe, it is time to ask a question: today, in Europe and on other continents, are we seriously thinking about what meaning to give to freedom? What am I doing with my freedom? The recent journey of Brother Alois in China lends still more importance to the need to ask ourselves these questions. Dear young friends! I greet you all once again and I hope your hearts – filled with various hopes and desires – will find in Poznań a sure answer to all your questions, that they may be touched by God and know true joy! Yesterday I told you: We are here together so that all of us can begin or deepen a change of heart. How can such a change of heart be accomplished? It is not primarily an act of will-power. It is when we turn towards God than our heart changes. It is God who changes it. Can we take time, every day, to turn towards God? In prayer God always comes to meet us. The Bible dares to say that in God there is a thirst to be in communion with human beings. God comes to us through Christ. The Eucharist is the clearest expression of this that is given. Through it we receive his life. The Eucharist is such a mystery; we can only receive it in the spirit of childhood and adoration. For all time, Mary is the witness to the fact that God comes to us. That is why we can also look to her. Here in Poland, faith in the Eucharist and the veneration of Mary have enabled a multitude to pass through the great trials of history by trusting in God. Through the Holy Spirit God dwells in our hearts and he speaks to us there, suggesting ideas and plans, and he also speaks to us through our desires. But how can we recognize this inner voice? Our heart overflows with an abundance of desires and aspirations. We want so many different things, sometimes contradictory ones. It is important to sort out our desires. Not all are bad, and not all are good either. We must patiently learn which to follow in priority and which to leave aside. To sort out our desires, to accept not to have everything, opens us to others, preserves us from isolation and leads us to share what we have. How is it that material wealth is often accompanied by a turning inwards, with a loss of real communication? Yes, many of us want to make this far-reaching commitment: choosing simplicity of life. Choosing simplicity opens our heart to share. Many initiatives of sharing and humanitarian commitments are within our reach. Here in Poznan, we see so many people who are walking along this road and who can lead us forward. If two of my brothers and I went to China recently, it was not to bring anything, but to listen to the Christians there. To listen and to pray for them, especially when disturbing news comes from that country. Listening to those nuns, we understood better the path of sharing, simplicity and selflessness. One of them told us, "After several months of working with people, many of us are going through a period of doubt. Why is there so much suffering?" Another said, "Seeing our inability to help people, I feel like Mary under the Cross." Yet another told us: "We were asked not to speak of the faith; that’s hard but I understand my vocation even better; being close to people is already living the Gospel. People suspect that there is a meaning to our lives, even if it escapes them." Could the testimony of those Christian Chinese religious women sustain our hope and the courage to choose simplicity? A child: Every night we say the names and we pray for the peoples who are here. This evening we welcome the young people from Belarus, Russia, Turkmenistan, Uzbekistan, Ukraine, Georgia, Albania, Serbia, Bosnia-Herzegovina, Romania, Montenegro, Lithuania and Slovakia. We welcome the young people from China, Hong Kong, Korea, Japan, India, Indonesia, Singapore, Philippines, Malaysia, Vietnam, Israel and Cyprus. We greet the cardinals, archbishops, bishops, priests and pastors of the Catholic, Orthodox and Protestant Churches of Poland and other countries. We welcome the representative of the President of the Republic of Poland and political leaders of the city and region of Poznan. Twenty years ago, the first young adult European meeting in Poland, just after the fall of the Berlin Wall, was a celebration of newfound freedom, a time of great joy. Today, are we thinking enough about the meaning of freedom? Freedom means being able to choose where to set our priorities. Freedom means not giving in to negative tendencies in ourselves. Freedom also enables us to fight against the structures of injustice in our societies. Freedom also means being able to express our faith. During my recent visit to China with two of my brothers, several people told us about the suffering that their parents or grandparents endured for the faith. Many of you who come from Poland or other countries of Central and Eastern Europe also have parents and grandparents who know what it means to suffer for the faith. We want to thank God for those Christians who have persevered and remained faithful. Today we can be close to believers in China. They are touched when they learn that at Taizé we pray for them on Friday evenings. This evening I would like to say a special word to the young people of Poland. You have deep roots in the faith. Across the centuries a tradition has been forged among you which has allowed your people to pass through great trials. Often these roots are linked to your family and the parish where you grew up. Today you are trying to renew the expressions of faith, and that is good. Outward expressions can change. Sometimes they have to change, so that the light of faith can shine with new luster. But this search will only succeed if it goes hand in hand with an understanding of the traditions you have received. This is the challenge: to create something new while finding support in tradition. Our small Taizé Community would like to remain alongside you in your searching. We have received so much from your country that we feel compelled to stay linked to you in the direction you are taking. The light that the children have just lit and that we will share with one another comes from far away: the flame was brought from the grotto of the Nativity in Bethlehem. This flame of peace and friendship exists to shine for all human beings. And so we cannot accept the fact that in the world inequality is increasing, that only a few benefit from economic prosperity while the vast majority experiences poverty. We want to choose simplicity of life to promote sharing, solidarity, and the responsible use of our planet’s resources. 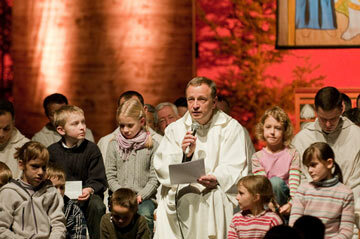 Every week next year, the meetings in Taizé will continue. In August, we will honor the memory of Brother Roger: it will be five years since he left us. And it will also be the seventieth anniversary of Taizé. There will be meetings this year in Portugal, in Sarajevo, and in Norway. Then, a year from now, we will have a new European meeting. It will take place in a country where it has never been held before. We will hold it from December 28, 2010 to January 1, 2011 in the Netherlands, in the town of Rotterdam. (in Dutch) For several months now, the preparation has been launched, and with enthusiasm. What a joy to see that all the churches in their great diversity are coming together to try and show a new face of the Church. Thank you to the Dutch! Our pilgrimage has expanded in recent years through meetings in Asia, Africa and Latin America. Why? Globalization, even with the ambiguities that it involves, gives us new opportunities to express the universality of our communion in Christ. As was announced a year ago, our fifth young adult Asian meeting will take place in a few weeks in early February, in the Philippines, in Manila. The Filipinos who are here with us assure us that doors and hearts are wide open to welcome those who come. And after Asia, we will go back to Latin America. From December 8-12, 2010, the second Latin American meeting will be held in Chile, in the city of Santiago. (in Spanish) Three years ago, our friends in Bolivia invited us to attend the first Taizé Latin American meeting. Now the pilgrimage of trust on earth will have a new stage in our country. For young Chileans and Latin Americans, it will be an opportunity to strengthen bonds of communion and to renew their commitment to be disciples of Jesus Christ and missionaries of his reign. With great joy we invite you to attend the meeting in Santiago, Chile. A child: Tonight we greet the young people from Moldova, Armenia, Croatia, Hungary, Bulgaria, Slovenia, Estonia, Latvia, Czech Republic, Italy and especially the young people from L’Aquila who experienced the earthquake last year. We also greet those from Chile, Brazil, Mexico, Puerto Rico, Cuba, Colombia, Argentina, Venezuela, Canada and the United States. We are very grateful for the welcome we have received. A heartfelt thanks to the families and all those who opened their doors so generously. Thank you to the Church leaders who supported the preparation. Thank you to the civil authorities who worked with us. During these days of meeting, everyone could discover that we are not alone. We are part of a fellowship of believers. We have seen that, in Poland, faith in Christ is inseparable from belonging to the Church. So more than ever it is important not to run away but to go towards, in order to express our love of this unique communion which is the Church. If I spoke to you every night about our trip to China, that was because I felt how special it is to be associated with the Christians in that country. China was a closed country for so long. Today we cannot stay away; that country is closer to us than we realize. I would like to speak about two more people I met on that trip. In Shanghai I saw a 93-year-old bishop who was in prison for 23 years because of his faith. In the difficult years, he thought that all religions would disappear from China, that there would no longer be any faith and that perhaps only after a hundred years missionaries would return. Things happened differently than he thought. He dared, after so many years in prison, to take on responsibilities. There are Christians in China who, like that pastor, are presently seeking reconciliation. It is something urgent between denominations, but also within each Church. In this, in Taizé, we feel very close to them. As in China, in the West a new thirst for interiority is emerging and attention to a beyond is being reborn. That is a sign of hope. So the time has come for you, young people, to realize that it is up to you to transmit trust in God to others. Even if you have understood little of the Gospel, put it into practice; talk to your friends who do not know the faith, and accompany some children along the path of faith, too. You know all of your peers who, upon entering adulthood, are losing their links with the Christian community, not necessarily by a conscious decision but by a simple chain of circumstances. Will you go towards them and seek ways to renew a relationship with the faith? What has the meeting these days given us? This afternoon you have tried together to find ways to renew your courage. Some words of a Polish saint, Urszula Ledochowski, can keep us alert: "Always on the road, never uprooted." Yes, in faith we are pilgrims. For all of us there are and there will be trials on the road. At times they seem to overwhelm us, so that even comfort from our family or friends hardly affects us. So what should we do? Is not our response to personal trials and trials that others endure to love more? These days we have been singing a song that could accompany us on our way home. It begins with the words of the Gospel of John: "Bóg jest miłością. God is love." And the song continues with words spoken here in Poland by Pope John Paul II, that dearly beloved pope, who always supported us in Taizé in our commitment with young people and for the reconciliation of Christians. Here are these words: "Miejcie odwagę zyc dla miłości; have the courage to live for love." A child: Tonight we greet the young people from Austria, Switzerland, Britain, Ireland, France, Germany, Netherlands, Luxembourg, Belgium, the young people of Kazakhstan and all the young people in Poland. We greet the young people from Togo, Senegal, Kenya, Cameroon, Eritrea, South Africa and Australia.